Apple has been releasing new brand iPhone every year since 2007. This year, iPhone 8 and iPhone 8 Plus came into stage. After one month, iPhone X is also available. Like always, new iPhone brings new functions as well as bugs. iPhone 8 blue screen of death is one of the most shocking bugs for many users. Software update, water damage, screen replacement are all the causes of this issue. If you are unluckily encountered iPhone X/8 blue screen on iOS 12/11, simply go through the solutions below to fix it completely. 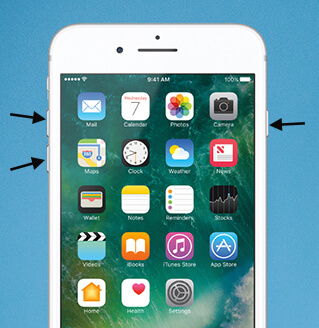 Hard reset iPhone is an easy way to fix software related issues, like blue screen, red screen or white screen. The steps of resetting iPhone 8/8 Plus and iPhone X is a little different with the former versions, here’s how to proceed. Press the Volume Up button and release it quickly. Press the Volume Down button and release it quickly. Connect iOS device to computer and run iTunes, make sure the iTunes version is updated. Now press and quickly release the Volume Up and Down buttons one by one just like Way 1 to force restart your device. Alternatively, you can try a free tool called Any iOS System Repair (ReiBoot), once click to put iPhone, iPad and iPod into recovery mode without pressing any buttons. Download and run the program on your computer, connect iPhone to PC. Once the device is recognized, click “Enter Recovery Mode” from the main interface. If your device boots normally after performing the 2 methods above, I highly recommend you to update or delete some faulty apps to avoid blue screen death appearing again on your iPhone 8/X. Update App: Go to App Store and tap on “Updates” icon, choose the apps you want to update. 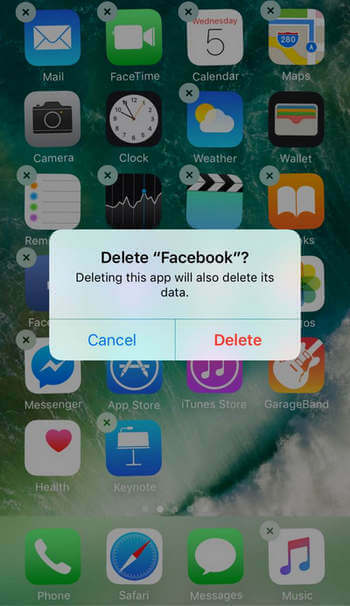 Delete App: Press and hold the app icon on your iPhone until you see a “x” icon at its top, click it to delete the app. Apps working in sync with iCloud can also be a reason for blue screen of death problem on iPhone 8. So when your device opens, disable app sync from iCloud. However, this is only a temporary workaround. Sometimes iPhone blue screen of death can be related to an unstable software version, update the software to the latest version will be a better way to go. If your device is responsive, you can go to Settings ->General -> Software Update to check for an update. If you are still seeing iPhone 8/X blue screen then turns off, restart or Apple logo, put iPhone into recovery mode using the methods above and connect to iTunes. When you see a pop-up message asking to restore or update, click “Update”. Note: However, when iPhone is unresponsive and the iTunes update failed to work, you can try iAnyGo, professional software to upgrade or downgrade iOS with only one click. Well, if the above methods failed to fix iPhone 8 blue screen and won’t turn on, keep restarting or vibrating, just try to repair iOS system with Any iOS System Repair (ReiBoot). It helps rescue iPhone from various iOS stuck disasters, such as blue scree of death, reboot loops, black screen, Apple logo and more without losing a single beta. Connect iPhone to PC and run Any iOS System Repair (ReiBoot), click “Fix All iOS Stuck” and you’ll enter a new screen. Click “Repair Now” to go on. Now just choose “Fix Now (All iOS 11 Stuck)” and the software will lead you to download the latest firmware. Click “Download” and then follow the default instructions to finish the process. iTunes restore will be the ultimate solution for almost every iOS stuck problem, but it will erase all the previous files. Make sure you have backups in iTunes or iCloud before performing factory restore. Launch iTunes and connect iPhone to computer, click “Summary” when the device is detected. Click on “Restore iPhone” and then confirm the step. If you still seeing iPhone 8/X Blue screen and frozen, flash or flickering after trying all the above methods, there must be some sever damage on your iPhone 8, just go to the Apple store or contact Apple for help. This article tells you how to fix blue screen of death on iPhone 8/8 Plus and iPhone X. If you are encountering blue screen stuck on iPhone 7/7 Plus/SE/6s/6s Plus/6, iPad or iPod, the fixes are similar. For further questions or inquiries, leave us a message below.